High Speed Rail Canada is the only source in Canada to obtain all the information relating to high speed rail past and present studies on high speed rail. In October they released the previously unavailable France national Railway SNCF (Société nationale des chemins de fer français - National society of French railway) and partners on High Speed Rail Socio-Economic Study between Windsor and Quebec City. Now High Speed Rail Canada is going to release FCPWorld Toronto-Kitchener-London High Speed Rail Preliminary Business Plan Study that was completed for the Ministry of Transportation. The study will be released in early November 2014. Like all other studies it will be available on our Google drive link from our website. Then Transportation Minister Glen Murray stated in May 2014, "A proposed high-speed rail link between Toronto, Kitchener-Waterloo and London would see 56 trains a day, or 28 each way, with fares around $40, according to Glen Murray, Ontario's Transportation Minister until the election call." 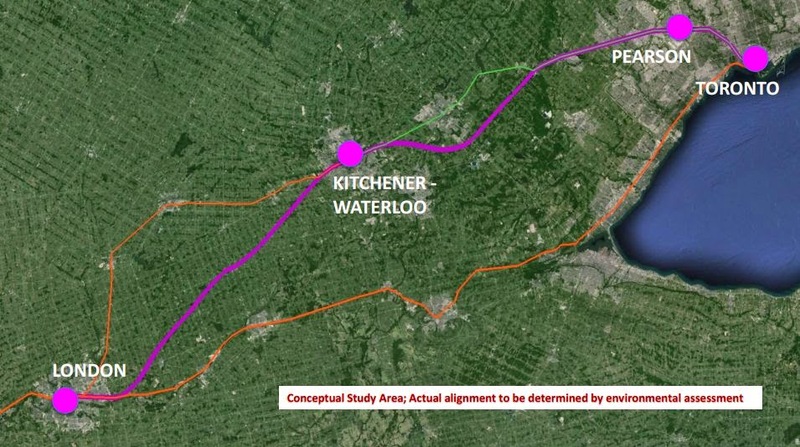 Check out our Ontario High Speed Rail Studies tab to our Google drive link with the Glen Murrary presentation on the proposal from his London Ontario presentation. Pro-transit Ontario Premier Wynne has repeatedly stated her support for high speed rail London-Kitchener- Toronto. The plan when released may have edited sections in it due to third parties not wanting certain financial information shared.